An easy-to-use website builder with good support for beginners - but is GoDaddy the right website builder for your small business? GoDaddy is one of the world’s most popular website builders and in our five best website builders for small businesses in the UK. GoDaddy is known for making it easy for small business owners with little or no website building experience to start growing their business online. Whereas most website builders focus on giving users absolute freedom to create whatever type of website they desire, GoDaddy gets that for a website to be successful online, it needs to be optimised to ensure you’re driving as much business as possible. To help our readers make the most informed decision, we put GoDaddy to the test ourselves. We built a brand new website with GoDaddy and our review below will help you decide if it’s what you’re looking for. And if you’re as impressed as we were, we’re giving our readers a link to get started right away and see how much GoDaddy can grow your business online with a free 30 day trial. As you read GoDaddy’s pros and cons, it’s worth thinking about what your goals are, where your expertise lies, and how much time you realistically have to devote to building your own website. Understandably, complete design freedom is what many first-time users think they want in a website builder, which can mean GoDaddy gets unfairly under-rated. But in terms of what matters for small businesses (not spending weeks trying to get your head around code; getting found on Google and driving more conversions), it’s a great website builder for beginners. Now onto the eighth generation of its web building software, GoDaddy is basic on the surface (for entry-level users), but every bit of fine tuning made on this new edition has been well thought out behind the scenes (in collaboration with those in the know at Google and other firms). That’s why (unlike many website builder reviews out there), we are valuing search engine optimisation (SEO) and site performance over how easy it is to take full control over your site’s design. One of the main reasons why users may leave website builders isn’t to try a competitor, but because their pages aren’t delivering the traffic and conversions they need to survive. So we think it’s important to rate website builders on how well they help you grow your business online. After all, there’s no point in having the prettiest of web pages if it isn’t properly optimised and not enough potential customers get to see it. GoDaddy can create professional websites like this one. GoDaddy has a decent range of pricing options and being one of the world’s most popular website builders means it’s able to offer some of the lowest average pricing prices (just beaten by a whisker by Wix). You can pay as little as £4.99 a month for a professional personal website if you’re just keen to leave your footprint online. Or more established businesses can boost their profiles and potentially send their sales rocketing by opening their very own online store for £19.99 a month. 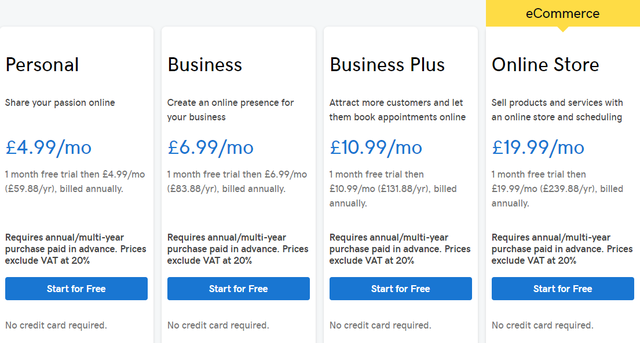 These price plans are fairly hard to beat, especially considering how much GoDaddy will do to help your business grow (including kitting you out with SEO, an online booking system and all the ingredients you need to run an online store). GoDaddy doesn’t currently offer a free plan, but you’re welcome to see if this option is right for you with a 30 day free trial here. Most small business owners are too busy to spend weeks designing their first website – they just want to get up and running with a site that will perform well and look good. GoDaddy is ideal if that sounds like you and has one of the more intuitive editors we tested. The sidebar-based editor is really easy to get the hang of. You just click a big + button to add components to your site and all the options are tailored to the sort of business you’re running (cafes will have menu options; actors will get a page on credits, for example). Plenty of website builders offer email support. But when it comes to asking questions or troubleshooting issues with tech software, nothing really beats getting someone on the phone to talk it through with you. GoDaddy offers 24/7 phone support, or you can live chat with a GoDaddy expert all day on weekdays. Getting started with GoDaddy could hardly be easier (or quicker) thanks to its intuitive ADI tool. You just plug in some simple details like the name and industry of your business and GoDaddy will auto-generate a template with pre-loaded content based on the type of website you’re making. GoDaddy has just launched this handy function which helps service-based businesses find new customers and keep their existing ones coming back. Now hair stylists, fitness coaches and home cleaners can book client appointments online 24/7, sync them with your calendar and get paid easily thanks to an integration with Square. The ADI-assisted content is surprisingly curated and can be tailored further by selecting the style you’d like to go for. Even if you opt to delete all this and go it alone, it can still be helpful seeing what your site could look like if you’ve never created a website before. GoDaddy’s SEO Wizard is one of its strongest features. You’ll be asked a few simple questions about the kind of targeting you’re after and GoDaddy will suggest the best keywords to use to help your site rank better on Google. Plus, included in the ecommerce plan is personal guidance from an SEO expert to help your products and services get found online. You can also run targeted marketing campaigns through the builder itself and even sync your online store with your social media channels for a complete and custom-built online marketing strategy. Websites should also be designed to look great on a phone screen – after all, it’s now where most of us will be visiting them from. Google Analytics is still one of the best-rated and easiest to use tools to track website data. Rather than trying to beat them, GoDaddy makes it easy to link your site to this useful free analytics tool. GoDaddy helps pages load faster by making sure the content at the top loads faster than elements further down the page (so everything will be ready to view when your readers get there). Plus, GoDaddy has a content distribution network (CDN) supporting each of their customers’ pages. This means images load faster (no matter where your audience is located) because the content is sourced from the third-party servers closest to users. If you’d like to take your business online, but have no experience building websites (and even less time to learn), we think GoDaddy is a great option. 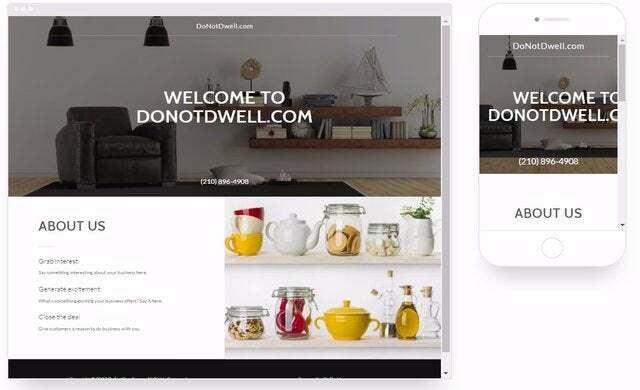 It’s one of the cheapest website builders; you can be up and running in minutes and the templates are all designed to give your business the best chance of success online. Plus, with a generous 24/7 helpline, help is at hand if ever you need it. Given GoDaddy’s tiny prices and huge expertise in helping beginners build successful websites, we’re happy to recommend this platform to our readers.